From bike storage to garbage cans, garages do a lot more than just shelter cars. In addition to providing storage, they are an ideal spot for tasks like gardening, bike repair and woodworking, because you’re protected from the elements and the space is easier to clean. A proper work station is one tool that serves all these purposes and more. 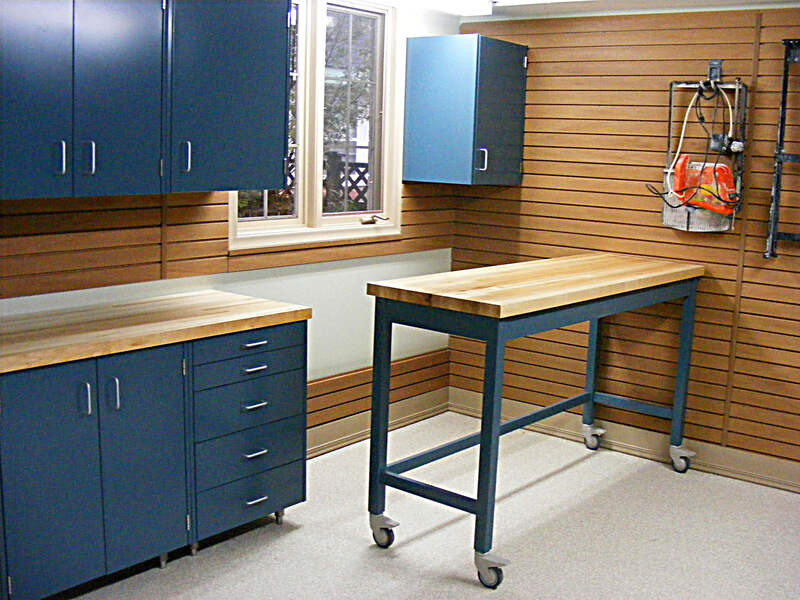 Unless you’re one of the rare people who have more garage space than they can use, a workbench has to fit in the storage solution when you’re transforming your garage so that it allows space to park cars and meet your other storage goals. Lack of space doesn’t mean you don’t have room for one, we just use a creative solution. 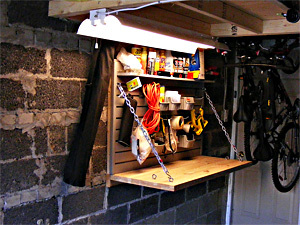 When we first see a client’s garage, we can assess the situation by seeing what is and isn’t currently in the garage. For instance, if someone has a large yard but not many gardening tools, chances are they have a service. 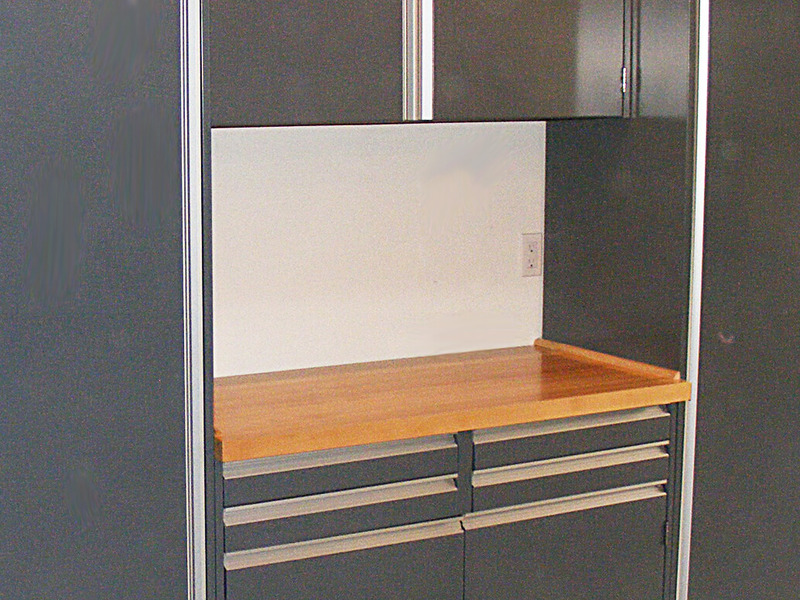 One of the solutions that we offered a recent client with a very tight space is a fold-down workbench. He came to us wanting to park a car, store seven bicycles and have a work bench. All this in a one-car garage. However, we did it. Click here to see the transformation. This particular work bench was a low-budget solution but it does the necessary job. It folds flat against the wall when not in use, which allows space to park the car. It even has a light! Another solution we recently came up with is a moveable workbench. We transformed a two car garage (click here to see it). It’s on lockable casters and fits snugly against the garage wall when not in use, but can be moved anywhere in the garage. This was important to this client because she is an avid gardener and is using the workbench for potting. As you can see, we customize storage solutions based on space, needs and budget. At one end of the budget spectrum is a very simple work bench of plywood, which has a surface to work on and a space underneath. At two feet deep with an adjustable width, we can customize it for any space. Above it you could have slatwall and shelves. A more finished solution may be a moveable workbench that includes cabinets and a butcher block surface. It’s sturdier, but it’s also a little more expensive. One reason you may want to consider a moveable work bench is that it gives you flexibility. If you’re cutting something that’s longer than the workbench, you can’t cut it properly if the space is confined. 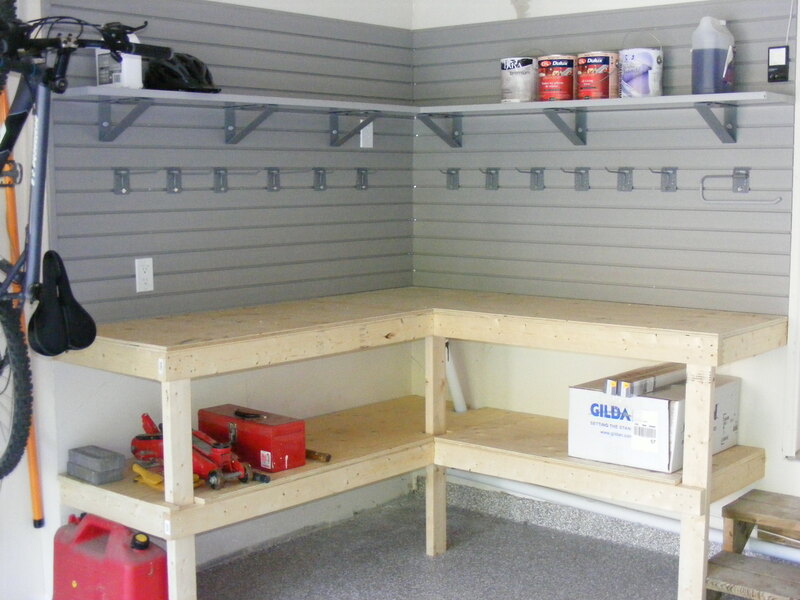 We create work benches that are customised, flexible and integrated into the entire garage space.